When the full text of the Austria's ultimatum to Serbia was published, public opinion was incensed at the severity of the demand. A feverish week of diplomatic effort followed among the nations of Europe. Sir Edward Grey, the British Foreign Minister, and Czar Nicholas of Russia worked ceaselessly in their efforts to prevent a declaration of war, for it had been foreseen that all Europe would be brought into the conflict because of preexisting alliances. It was proposed to hold a conference in London to mediate the dispute between Austria and Serbia. France and Italy quickly agreed, but the Teutons declined because their hearts had been set on war and their preparations completed down to the last detail. Indeed, it is known that the day after the crime, Austria issued secret mobilization papers to her subjects abroad. Kaiser Wilhelm had returned from his cruise and Britain went mad with war fever. Austria sought to pacify or mislead Russia, July 24, by pledging herself not to annex Serbian territory in event of war. Russia asked that an extension of time be granted Serbia in which to reply to the ultimatum, but was answered in the negative. The next day Russia published her warning that she would render assistance to Serbia if the Slav race were attacked. Sir Edward Grey proposed a conference of neutral ambassadors to compose the differences of Serbia and Austria, but this solution was rejected by Germany, who on the same day urged France and Great Britain to persuade Russia to remain neutral, a cold-blooded proposal which England and France rejected. Next the Kaiser pleaded with Russia to allow Serbia to be destroyed by Austria. In reply the Czar suggested referring the whole matter to the Hague Tribunal. To this suggestion Emperor William made no reply. 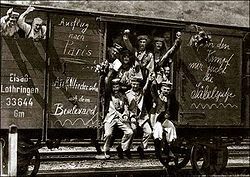 July 28, Austria declared war on Serbia and marched her army toward Belgrade. The next day Emperor William made a shameless bid for British neutrality, pledging Germany to take no territory from France in case of a German victory, but omitting mention of French colonies in Egypt and Africa; nor was any mention made as to sparing the French fleet, or as to the size of the indemnities to be imposed on France. This typical German proposal was declined with scorn. On July 30, while Austria's army was on the march, Russia began to mobilize toward the Austrian frontiers. The next day Kaiser William, whose own army of 830,000 was practically mobilized, sent an ultimatum to Russia, demanding that she cease further mobilization within twelve hours. The same day he made his last "shameful proposal" to England, saying he would not violate the neutrality of Belgium "provided" Belgium did not stand out against Germany. This proposal, too, was rejected by England. England then sent to Germany and France identical notes asking them if they would respect Belgium's neutrality. France gave her prompt assurance, but Germany countered by inquiring whether England would remain neutral if Belgium were spared. Again England declined to dicker with the Huns. Meanwhile the German ambassador at Brussels was giving daily lying assurances to Belgium that she would not be attacked. France had made two requests to England to engage her support in event that France were attacked, but England would not at first consent. Meanwhile, in compliance with the terms of an old treaty, France withdrew her fleet from her own coast in order to protect British interests in the Mediterranean. England thereupon assured France that if her coast were attacked she would defend her on the sea. 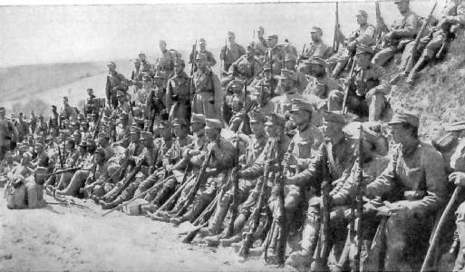 Austria assembled 25,000 troops on the west bank of the Danube, opposite to Belgrade, Semendria, Gradishte and other Serbian cities along the whole Danube front. As the first shell burst ineffectively over the battlements of the old Turkish citadel of Belgrade, an answering cannonade immediately sounded from the Serbian guns. Thus was ushered in an artillery duel which continued for weeks along the Danube front. The Serbian government at once withdrew to Nish and the evacuation of the citizens of Belgrade was hastily accomplished. Little was left of the once beautiful city of Belgrade after the bombardment had ceased. More than 750 buildings were demolished. Only the shell of the King's Palace remained standing. The University of Belgrade was entirely destroyed; the old unarmed Fortress, a grim reminder of the Turkish occupation, was reduced to dust; the venerable Museum, stored with antiquities derived from pagan Rome, was wrecked; the great cigaret factory, which the Serbian government operated as a state monopoly, was demolished; factories, foundries, and bakeries along the banks of the Danube were razed to the ground; the hospital buildings and the foreign legations all suffered injury; and the principal streets were torn up by the exploding shells. The Royal Serbian Government not having answered in a satisfactory manner the note of July 23, 1914, presented by the Austro-Hungarian Minister at Belgrade, the Imperial and Royal Government are themselves compelled to see to the safeguarding of their rights and interests, and, with this object, to have recourse to force of arms. Austria-Hungary consequently considers herself henceforward in state of war with Serbia.